one month counts as a while..!! tested in chrome and ff. comment pages are not stylized. instructions. 1. apply one of the basic boxes themes. make sure the page layout is two column, sidebar on left! 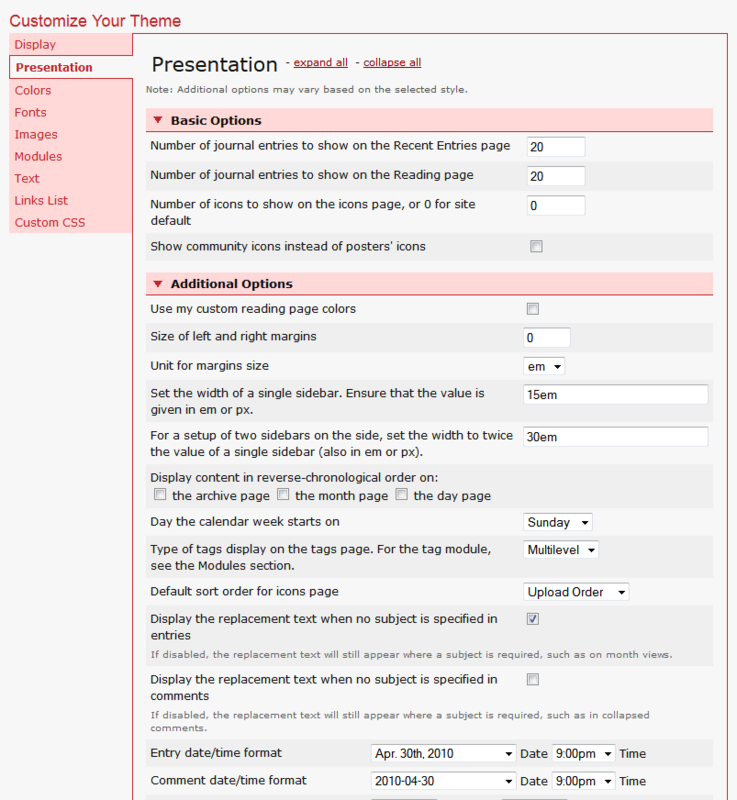 2. go into presentation, scroll down, and change the interaction/management links from ICONS to TEXT-ONLY. 3. OPTIONAL: go to modules and uncheck everything but PROFILE, LINK LIST, and NAVIGATION (make sure the dropdown list for navigation says HEADER). leave the numbers and drop-down lists alone. optional because the modules are disabled in the code, but it never hurts to be careful. 4. turn off 'use layout stylesheet'. 5. accent color is #CF1931; replace as you wish! 6. to place an image in the header circle or userpic circle, search for #header (256px by 256px) or .module-userprofile (140px by 140px and replace the bg images. 9. comment pages are not stylized! credit. please credit pastries somewhere and/or leave credit in the css! I'm still madly in love with "In Space," but this is really pretty and creative! I love the use of circles and color scheming. Great job! *O* gorgeous! Will credit when I use. I have a question (and I hope it doesn't come off as rude or anything) but are the comments really supposed to look unmodified/green? 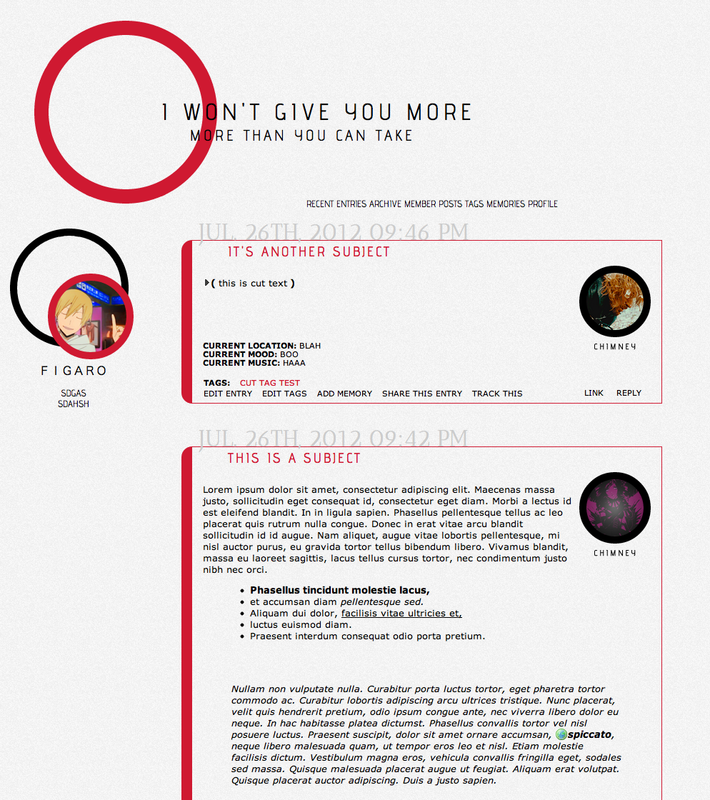 I'm currently using this layout at schizobunny and you can see what I mean about the comments here. This is amazing! ♥ Using it now and credit is applied in my profile. this is awesome! thank you so much! using it! This is really cute and I'm in love with it-- just one question. Is there a way to get the entry text from overlapping with the poster username? You can see it happening on this reading page. aaahh go to customize style, modules, and make sure NAVIGATION is under HEADER in the dropdown list, not main or secondary. I have a question; would it be possible to move the journal title more to the right so it won't overlap with the image in the circle? Or move the user icon outside of the entry box? Is there a way to center the entire layout? First of all, I have to say you make absolutely gorgeous layouts!! :) Looking them over makes me want to start more journals or communities, just to use them all, lol. Secondly, I was wondering if there's any way to change the color of the black circles, and the background color of the entries? hey! sorry, been a bit busy. by the black circles do you mean the one on the left hand column or the circle around the icons? as for the background-- find .entry and add background: #HEXCODE; or background: url(IMGURL); if you want to put a texture or something back there. Yooo I have to say I LOVE this layout. I love the circles. The ooonly problem is that for some reason, when it's viewed by any other journal other than my own, the circle with the display pic appears at the very bottom? If you go to my journal you'll be able to see. Any idea what could be causing that? Ah... Nevermind? It seems to be entirely based on how much text and entries I have on my journal. I places a cut on one of the entries and it fix it...somehow? I'm not sure how or why, but it's fixed for now. i really love this layout!! totally using it... but a question! is there any way to add a single image to the right side of the layout? ...possibly! how do you mean 'to the right side', though? I've got a question: Is there a part of the coding that forces the time on the replies to appear in the 24-hour format rather than 12-hour? there isn't, that i know of. I've stalked this comm for a while and only just got around to using something. It's this! Because it's beautiful. I'm using it for a small graphics comm I made to dump my stuff from time to time - I had to tweak the width a little so that the huge tables of icons and stuff didn't fall out of the pretty post borders but I'm hoping that's not too much of a problem? Super good work!! Gonna keep stalking. Ahh yes the sweet smell of pretty pretty code. Using and enjoying. I may or may not change the background. Thank you for sharing and all your effort. This is gorgeous! I'm using it on this account and thank you much for making it. I do have a question though: I'm just trying to figure out how I get rid of the userpics and have the entry content be in center. I've tried visibility: hidden and outright removing the .userpic but nothing is working. Is there a way I can do what I want? If not, it's not the end of the world! we can get it to look like this if that's good? 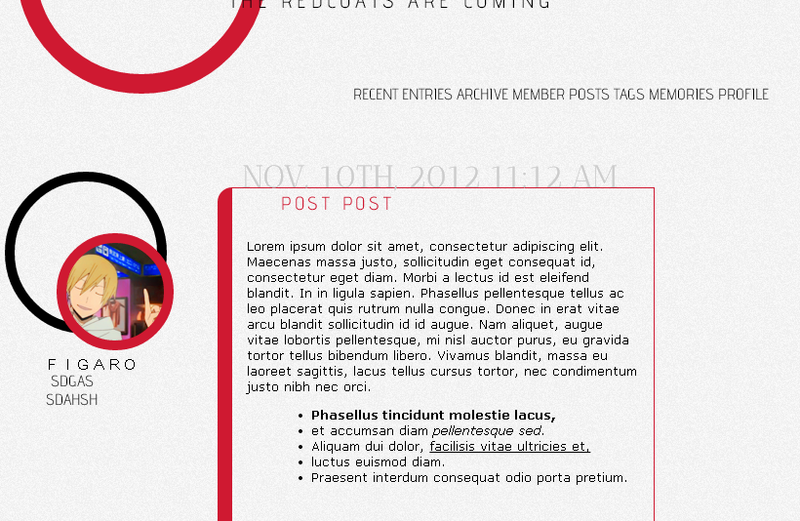 Just thrown this on my blog and it looks great, just thought you should know. the green is part of the comment header and can be found and modified by searching for '.comment .header' in the code.